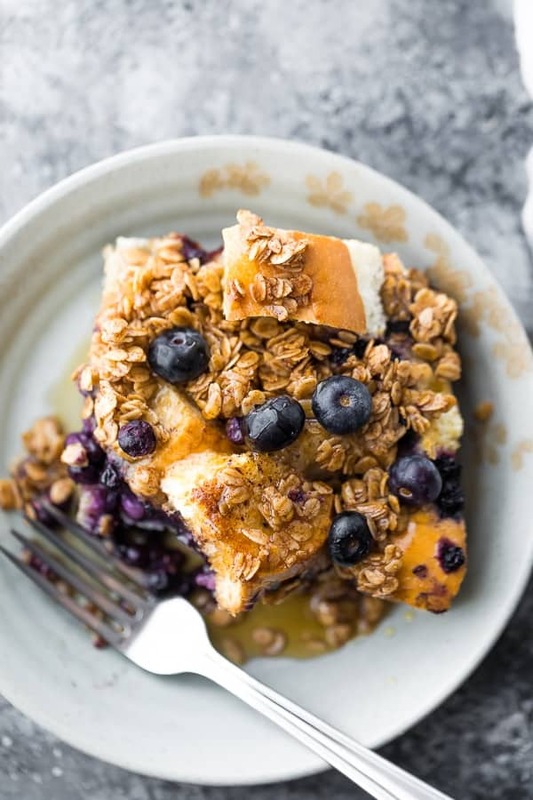 Blueberry overnight french toast bake is the perfect breakfast or brunch recipe for a crowd! Assemble it the night before, and bake it up in the morning. Breakfast is really not my forte, mostly because I am a complete and utter zombie. Especially now that I’m up at least once in the night with the baby…elaborate brunch recipes are not gonna happen around these parts! 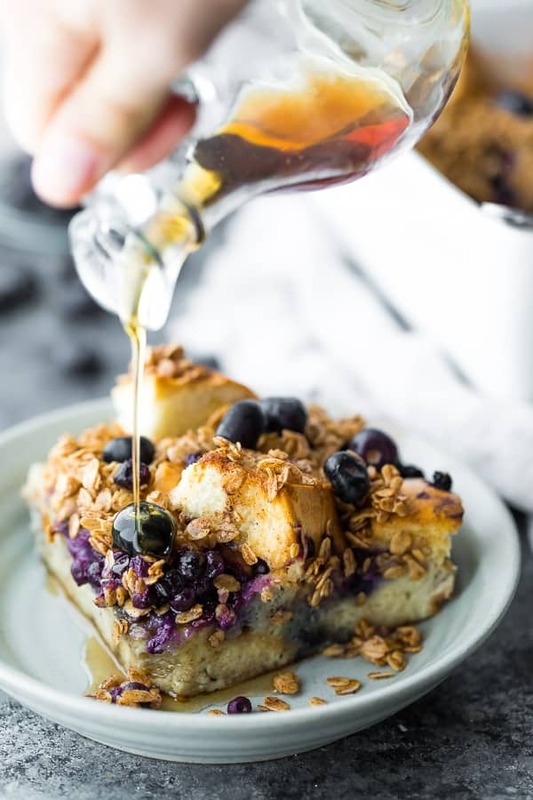 I have been loving the overnight breakfast recipes for this reason…I shared my favorite Overnight Breakfast Casserole with Bacon and Sweet Potato a few months ago, and now I have a total Mother’s Day-worthy overnight brunch recipe today: this Blueberry Overnight French Toast Bake! Not only does this recipe solve the problem of someone having to stand at the stove, flipping the french toast, but it also solves the problem of having to do the prep work in the morning: most of the prep is done the night before. In fact, it’s better this way, since soaking the bread & egg/milk mixture means it’s going to absorb so much more and will taste so much better the next day! What is overnight french toast? It is all the same flavors as traditional french toast, prepared slightly differently. We simply cut a loaf of bread into cubes and soak it with an egg/milk mixture overnight in a casserole dish. 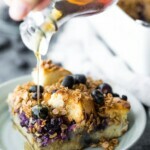 This recipe has bit of maple syrup to sweeten it slightly, some vanilla, cinnamon and nutmeg to give it a nice flavor, and frozen blueberries scattered all over it. After pouring the liquid mixture over it, we cover the overnight french toast with plastic wrap and refrigerate it overnight. Taking the time to soak your french toast bake overnight lets the bread soak everything up and gives it so much more flavor, not to mention keeps it from tasting dry. Turning french toast into a casserole makes this so much more hands off and means that no one has to stand over the stove flipping the toast. That way you can be free to visit with your guests, or get some other things done while the casserole bakes up. 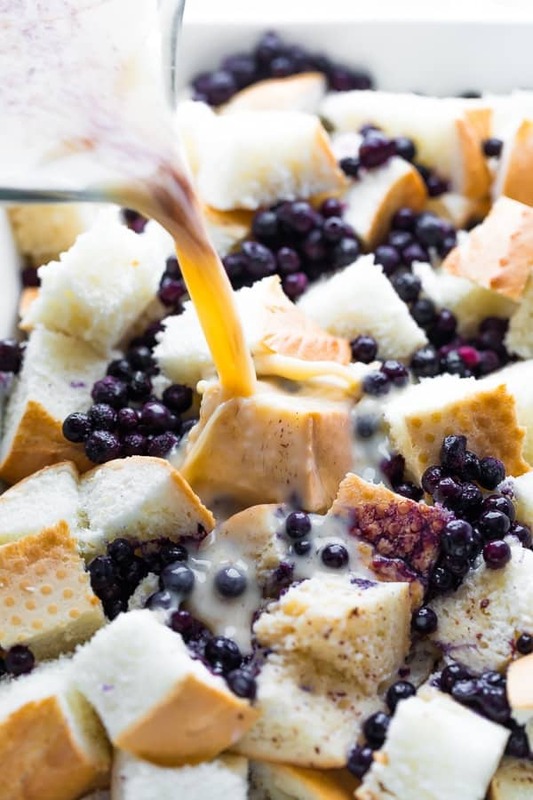 What kind of bread can you use for this overnight french toast casserole? You can pretty much use any bread you’d like, however I recommend a thick and sturdy loaf from the bakery department of your grocery store. I used a sourdough loaf for my overnight french toast casserole. You can use challah, brioche, baguette or any french bread for that matter. You can even use a flavored loaf like a cinnamon raisin, however I opted for simple so that the blueberries really shined through in this recipe. If you’d like to make it a bit healthier, you could even opt for a whole wheat bread. I was unable to find any whole wheat bread suitable for this overnight french toast bake at my grocery store, so I went with white. 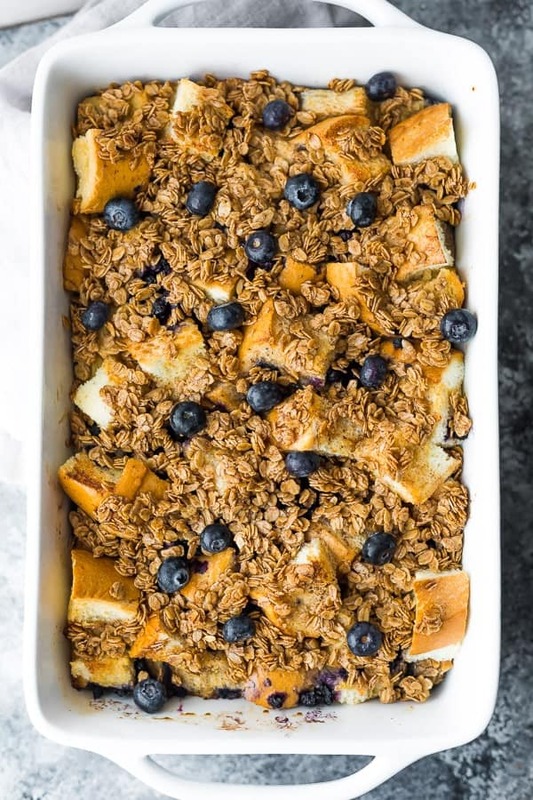 This overnight blueberry french toast bake is super versatile! Not only can you swap the type of bread you used, but you can add so many other flavor variations! swap the blueberries for any berry: strawberries, blackberries, raspberries, cherries, you name it, they’d all be great! I used my new favorite casserole dish (this 8 x 13″ one from Crate & Barrel). Grease a large baking dish (8 x 13 or equivalent). 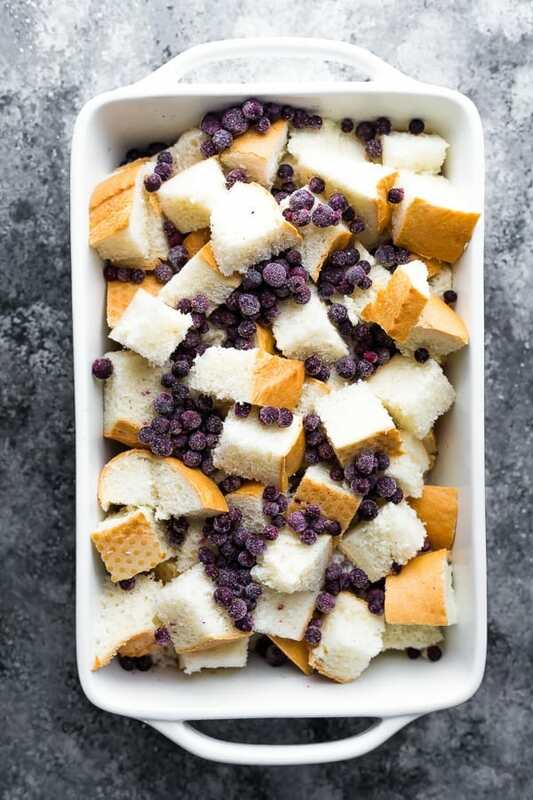 Scatter half the bread cubes, then half the blueberries. Repeat with a second layer. In a large bowl, beat the eggs. Add the milk, vanilla, cinnamon, nutmeg and maple syrup and mix until combined. Pour evenly over the bread cubes. Cover the casserole with plastic and store in the fridge overnight. The next morning, stir together the crumble topping ingredients. Scatter evenly over the top of the casserole. Heat the oven to 350°F. Bake the casserole uncovered for 45 minutes - 1 hour. Start checking at 45 minutes by inserting a knife in the middle of the casserole. If liquid oozes around the knife, keep baking. 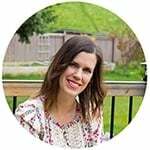 Allow the casserole to cool for 10 minutes before serving with maple syrup and extra blueberries. Leftovers keep (covered) in the fridge for 3-4 days. Nice post. Great to read your recipe. I love this. Thank you so much.